"Here comes the stage coach!" The cry sends loafers and gossips scattering as Barnard's Express stage rumbles up the main street of Barkerville. Hens squawk and scurry before the thudding hooves of straining Percherons. Two hurdy-gurdy girls hoist their long skirts above the dusty street and, still eyeing the stage speculatively, hustle for the safety of the board-walk. A grubby miner, laden with supplies, plods on, indifferent to this messenger from 'outside'. Passengers lean from the windows eager for a glimpse of this famous gold mining town. Those riding on top hold tighter to their precarious railings as the stage rounds a corner and the entire main street comes into view. It's a bustling community of churches, saloons , and restaurants. Signs advertise the offices of the newspaper, government mining assay branch, dentist and doctors. Outside the Theatre Royal a bill-board announces that afternoon's music hall performance. Evidence of mining is everywhere. Above the buildings a system of flumes on stilts crosses the street carrying water from the mountain side. The dull constant squeak of huge Cornish wheels pumping water from mine shafts fills the warm August air. Mounds of mine tailings in every direction make it seem as if half the earth in the valley has been sifted for gold. "We're really here!" passengers exclaim excitedly. "Barkerville!" Townsfolk stare at the stage as it rolls along. Barnard's Express is renowned among North American stage lines. Today's driver, James 'Happy" Hamilton, is a bit of a legend himself. He's admired for never having had an accident while driving stage - a notable record on the rough wagon roads of the Cariboo. Though a stern and conscientious driver, Hamilton is rumoured to have an eye for the ladies. Gallantry is certainly evident in the flourish with which he helps the female passengers to alight in front of the Wendle House. While passengers stretch and look for refreshment, the horses take a breather in the sun. Just another summer day in Barkerville. Except that this isn't Barkerville 1861. 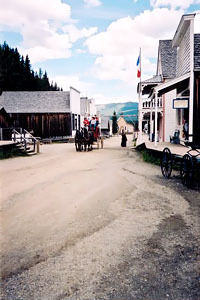 It's Barkerville 2001, a town where history comes to life. During the 1860s Barkerville was the gold capital of the world. Miners searching gold bearing streams were followed by store keepers, barbers, school teachers, and post masters. Barkerville became the largest city west of Chicago and north of San Francisco. In addition to the usual saloons and dance halls it boasted a dramatic society, public library and poet laureate. Francis J. Barnard looked at this instant community and saw opportunity. Surely the new comers would want to write home. And, home was Eastern Canada, Austria, California. In 1861 Barnard began to carry mail from Richfield (a mile beyond Barkerville) to Yale. The miner's trail was far too narrow for horse or mule teams so Barnard walked. He charged $1.00 per letter. By 1865 when the Royal Engineers completed the Cariboo Waggon Road Barnard had saved enough money to buy a stage coach and open an office in Barkerville. Barnard's Express took out freight, gold and passengers. Second in size only to Wells Fargo, it became the longest, most successful stage coach run in North America and a model for other operators. Barnard established a series of mile houses with fresh teams at each stop, one of the first in North America to do so. In time those stopping places grew into towns. 70 Mile, 100 Mile commemorate Barnard's planning. In addition to stage coaches, Barnard ran wagon trains. Up to 25 mules would haul 4 or 4 heavy freight wagons. Barnard's was noted for its attention to security - an important factor when shipping gold. Gold was put in a safe in the wagon or coach. Only the driver and a recipient at the other end had keys. There were thieves and scoundrels along the Cariboo Road but they had no success with the Express. In one robbery attempt the thieves got the crate of gold off the wagon but the safe was so heavy they couldn't carry it away. Nor could they open it. They were forced to abandon it. Whereupon the driver came back and picked it up. Those were long trips. Passengers would leave Barkerville on Saturday and, barring accidents, arrive in Yale a week later. The fare, one way, was $80.00. Barnard shrewdly sold his express business just before the railway came through. Soon freight shipments moved by rail rather than wagon. But, for almost a decade Barnard's Express played a major role in transporting goods and people into the heart of a wild, rugged land. The influx of new settler led to the formation of the Province of British Columbia. 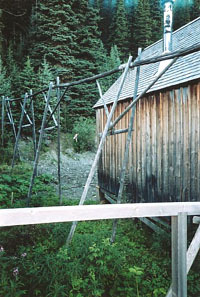 When gold output in Barkerville decreased, hydraulic machines replaced individual miners. Determined Chinese miners painstakingly panned out gold overlooked before. Eventually, except for a few determined residents, most people moved away. Barkerville declined into a wistful settlement of dilapidated houses and rusting machinery. By 1900 it was all but abandoned. In 1958, however, the B.C. Government decided to restore the town which had done so much to attract settlers. 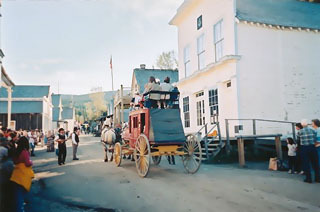 It's a lot less muddy, dusty and dangerous than the original town, but the Barkerville of 2001 replicates as much as possible the settlement of 1861. Over 120 buildings have been restored or reconstructed. 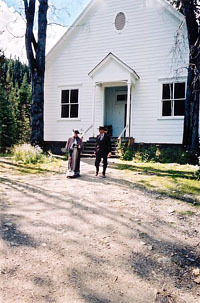 Visitors can buy a (root) beer in a saloon, attend Evensong at St. Saviour's church, try their luck at gold-panning, observe a trial before Judge Begbie, savour sour-dough biscuits and walk back in time as they follow "Miss Wilson" along main street, entertained by her pithy comments on the settlers foibles. More than 100,000 visitors each summer participate in the life of frontier Barkerville. But, what's gold town without a stage coach? Exactly what the government thought. In 1990, 120 years after he sold his company, the freight wagon and stage coach of Barnard's Express rolled back into Barkerville to the visitors delight. The stage, built in 1963, is a replica. The freight wagon has an authentic antique under-carriage but everything else is restored. Both are working conveyances. After 9:00 a.m. no modern vehicles are allowed on site. Anything which must be moved is moved with the freight wagon. Among the regular tasks are transporting mail from the post office to the front gate every day and distributing meat orders on Thursdays. From 10:00 a.m. to 4:30 those horses earn their grain with the stage providing tours of the town-site and up to Richfield court house. It's a popular trip as the summer of 2000 saw 9.996 visitors riding the stage, and in 2001 that increased to 10,529. Mr. Barnard would be pleased.